I hope you all enjoyed the Dormant Retiring Blog Hop this weekend. There were some amazing creations from some very talented ladies!!! I'm looking forward to the next hop in January, featuring goodies from the new Occasions Mini and Sale-A-Bration catalogs coming out. Woohoo! 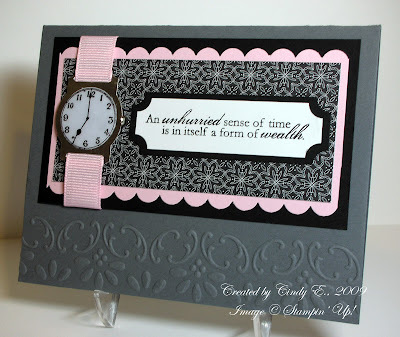 This past Saturday was the stampin' club meeting and card swap. The theme for December was "Time", and I gotta tell ya, that one REALLY gave me trouble. I have the Sense of Time stamp set, but didn't want to just stamp the clock and sentiment - too plain. The Designer Label Punch has always reminded me of a watch case, but I couldn't figure out how to make the watch face to fit it, not having a stamp that small. My upline, Rosalie, came to the rescue and suggested finding an image of a watch face online and printing it out. Duh! I never would have thought of that; I was stuck in stamp mode. Off topic: Please pray for my mom and her husband. They were involved in a rollover accident yesterday, and she has a concussion (for the third time in two months) and he has broken ribs and a punctured lung. Your card is sensational. I never would have thought about that. I will be praying for your mom and her husband. Please keep us informed. Hugs to you!